I just finished working on my latest crochet pattern which is now available on Etsy: a cute bunny rabbit and his favorite snack, a fresh and yummy carrot from the garden. He was inspired by another pattern I made a few months ago to crochet a squirrel holding an acorn. I am very happy with the result, It turned out exactly how I pictured it! Maybe I should turn it into a series of animals holding their favorite snacks! He’s about 11 inches tall and crocheted with a 2.75mm hook. I used Red Heart Super Saver for the bunny and Caron Simply Soft for the carrot but using these specific brands is not mandatory. I picked an off-white color to crochet the bunny because pure white gets dirty too quickly. This little bunny is easy to make. I like to keep my patterns simple by using basic stitches and techniques such as single crochet, increase and decrease. I also use a lot of descriptive photos to give help with visuals. I Think I am going to take this bunny for a stroll in the garden and see if he will start hopping around or make friends with the real rabbits. You can visit my Etsy shop If you are interested in this pattern or would like to see more pictures. I love squirrels, I think they are really cute and funny. Not long ago I had an encounter with a poor little critter that was desperately trying to escape the trap a friend of mine had set behind her house. I felt so bad for it that I opened the trap to set if free, unbeknownst to my friend who wouldn’t have been happy if she had known what I had done. 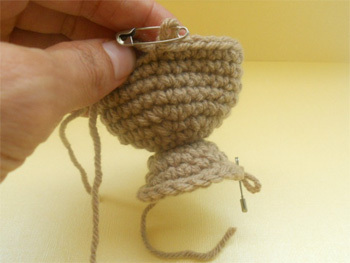 That little episode gave me the idea to work on a squirrel crochet pattern for my next ETSY project. That little squirrel was really a source of inspiration, I really enjoyed making this amigurumi which turned out to be very easy to create. The squirrel is about 9 inches tall and crocheted with a 2.75mm hook. I think it turned out really cute. Some of the parts are glued together like the feet to the thighs and the tail to the back. 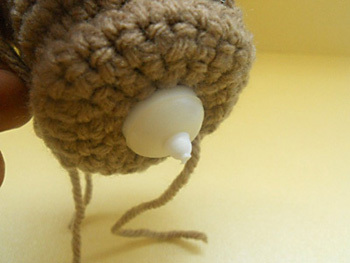 I crocheted a little acorn which I glued to the hands. I was going to use velcro which would have allowed removing the acorn I but decided at the last moment to make it permanent. I love my little squirrel, and I am really happy with the pattern. If you are interested in this project, the crochet tutorial is available on ETSY. Now that I am finished I wonder if my next crochet inspiration will come from another animal rescue! Recently, I did save a bird from my being shred to pieces from my cat so maybe I could do that next? Jointed amigurumi dolls are crocheted dolls, or plushies with fully movable arms, legs and head. There are made with disc joints that are pinned in the extremity of each part. 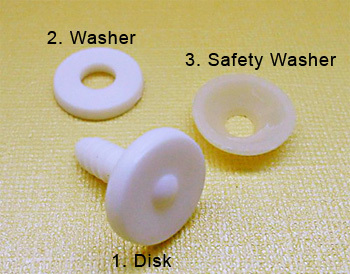 There are different kind of joints: the plastic disc joint which come in three parts (the disk, washer, and safety washer). The cotter disc joint, also in three parts (the hardboard disc, washer, and split pin). Some discs come with a metal nut and bolt. The ones that I have are plastic, I bought them on ETSY. I will admit that they are hard to pin, but once they are in place, there is no worry that your disc will get loose! It’s better to pin before you finish stuffing any parts. For instance, if I work on a head, and body, I start on working on the body before I finish the head in order to pin them together. Same with the arms and legs. (If you work with this kind of plastic pins). I haven’t tried the metal joints yet, but I have a feeling it might be easier to work with them than the plastic ones. 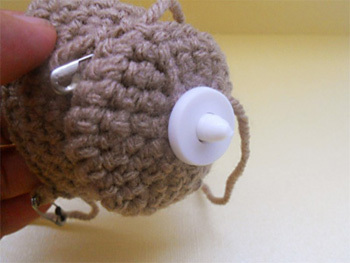 There are other alternatives to join dolls, such as thread, buttons, or safety eyes. I am not a fan of threaded joints, it didn’t feel secure enough to me. I haven’t tried the option with the buttons, but I like the safety eyes, I used the on several occasions and they are easy to work with. Just pick ones that are big enough for the job. 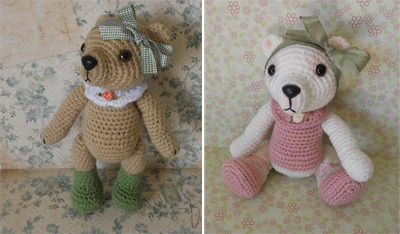 If you are interested in working with joint crocheted dolls, there are a lot of cute patterns available on ETSY. I wanted to link the one I bought last year, a really cute vintage jointed bear, but unfortunately the lady (Bluebeary Treasures) retired and is no longer selling patterns. I made two bears with it, I used her pattern as a base, and took off on my own from there. What I love about jointed amigurumi dolls is the fact that you can give them a pose. You can move their head from side to side, have their arms up and down, or have them sit or stand. It really gives your doll some personality! Whether you use plastic joints, or metal, thread, buttons, or safety eyes, the best thing to do is to try different options, find out which one work the best for you. I intend to try cotter disc joints next to see if I like them better than the plastic ones, so I will probably make another post on the subject in the near future. I hope you have found this post helpful and informative. 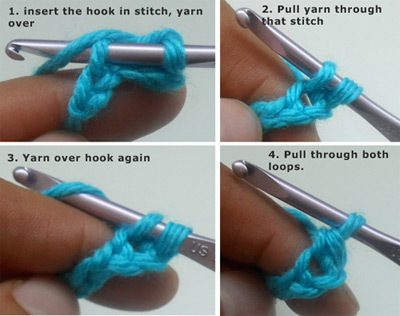 In the mean time, Happy crocheting! Voila! 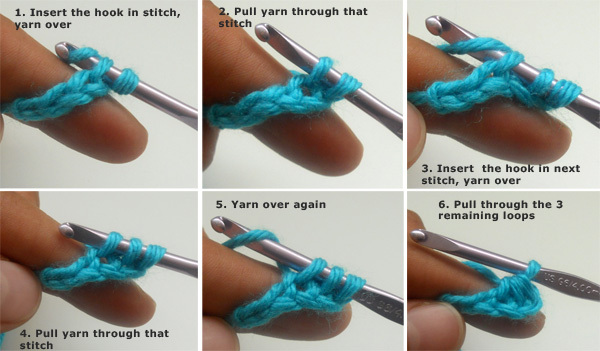 This is all the basics you need to know to start your first amigurumi. Now you can go to my easy Beginner tutorial, and learn to make a cute crocheted apple. I hope you have found these tips helpful. If you have any questions, don’t hesitate to comment!